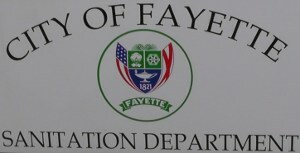 The mission of the Sanitation Department is to provide solid waste removal services to the citizens of Fayette by collecting and disposing of discarded material in a safe, efficient, and environmentally sound manner. The City provides carts for weekly collection in residential areas. Commercial collection services are provided by Waste Management.